Slapfish started life in 2011 as a food truck serving boat-to-plate seafood. Now, it's planning to open its first Maryland location in Rockville. Menu items include chowder fries and clobster-grilled cheese. 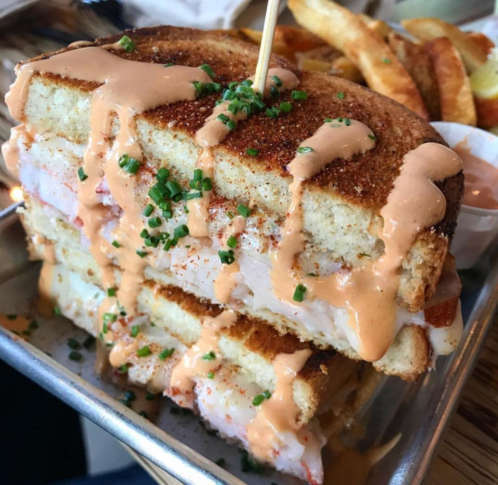 WASHINGTON — Slapfish, which started life as a West Coast food truck serving boat-to-plate seafood in 2011, is opening one of its fast casual restaurants in Rockville this summer, its first in Maryland. The company, which is based in Huntington Beach, California, plans to open up to 20 locations throughout the Mid-Atlantic, Philadelphia and New Jersey in the next five years. The Rockville location, at 12055 Rockville Pike at Montrose Crossing, will be the restaurant’s 13th location. It will open in early June. Slapfish, which bills itself as “ridiculously fresh, refreshingly responsible,” aims for both health-conscious and indulgent diners. Menu items include chowder fries, lobster grinders and a clobster-grilled cheese. The menu also includes lettuce-wrapped fish tacos, grilled shrimp burritos and a Surf n’ Turf lobster burger. The Slapfish menu also includes daily and seasonal features. The company has plans to open over 150 locations, with others coming this year in South Korea, the U.K., Nevada, Arizona, Florida and Northern California.